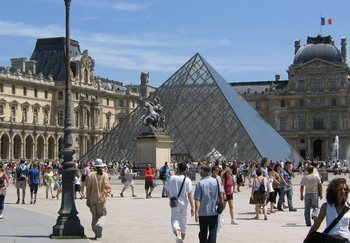 The Pyramid designed by the American architect, IM Pei, at the Louvre. 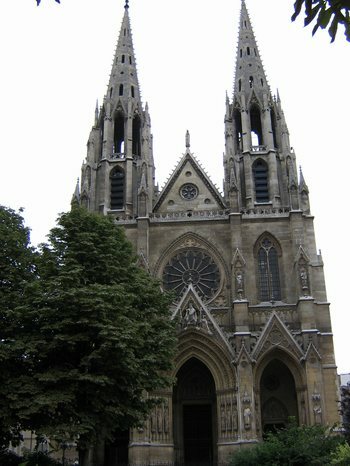 The Sainte Clotilde Basilica in the 7th arrondissement. 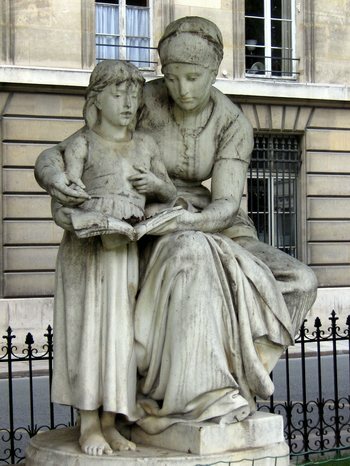 Statue in the park in front of the Sainte Clotilde Basilica. The expulsion was described as “virile” and “powerful,” forcing the families of squatters to leave behind many of their possessions. They took only what they were able to carry. Lots of children’s toys were left behind. Lots of children were crying their eyes out. I don’t understand this chaos because the government claims that they had everything all ready, with 1000 hotel rooms and services available. But only about 300 of the 500 squatters were put up in hotels that first night. The government claims that the problem was that the non-profit associations had convinced 200 or so of the 500 squatters not to budge. But I think part of the problem was that the government was offering only one month in a hotel, and what would happen after that was unclear. So many of the children in the remaining group (about 60 of the remaining 200 squatters are kids) got sick from sleeping outside in the cold. Temperatures at night, outside Paris, were in the 50s F. Neighbors offered the families the use of their bathrooms. Then the next day the government sent in forces who used brutality to force the remaining squatters to leave the grounds. After about 10 minutes of violence, the squatters were defeated. In the violence, one woman had her knee broken, a man had his ribs broken, and a little boy had his lip split open. Two pregnant women fainted. A man was unconscious, probably because he was hit on the head. By about 8PM, the local government of Cachan (with a Socialist mayor) had temporarily provided a gymnasium for them to stay in until they can be placed in “appropriate” lodgings. The gym is too small for everyone, so the women and children sleep there, and the men sleep in the corridor or outside. The mayor is pleading with the prefecture and the national government to come up with a bigger facility. It is the prefecture and the national government that are forcing the end of this “squat,” not the city of Cachan. But the prefecture and the State have not yet mastered the situation. Out of the original 500 squatters, forty-some did not have legal status and are going through the tribunal process. As for the Cooleys, we went on a long walk yesterday and had a relaxing lunch at Le Bourbon, the beautiful brasserie/restaurant on the Place du Bourbon, right next to the National Assembly building. Then in the evening, we had a delicious dinner (the travers de porc – barbequed ribs- are finally back!) with J and M from Sanibel at La Gauloise. We enjoyed meeting their friend Nancy, a Californian, who also dined with us.